President of South Africa since 1999 and President of the ruling African National Congress since 1997, Thabo Mbeki is the "respectable" face of the new South Africa. Like his mentor, Nelson Mandela, Mbeki has a semi-hidden radical side. 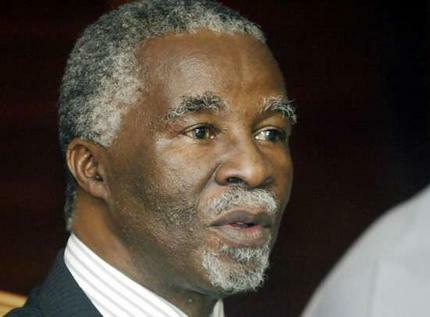 Born in 1942, Mbeki was the son of prominent South African communist and ANC leader Govan Mbeki. Thabo Mbeki joined the ANC Youth League in 1956. The young Mbeki was expelled from High School in 1959 for being involved in student strikes. He continued his studies extramurally and in 1966 gained a Master of Economics degree, from the University of Sussex. Mbeki was involved in underground activities in the Pretoria-Witwatersrand area after the ANC was formally was banned in 1960. In the UK, Mbeki was active in mobilising the international leftist student movement against Apartheid. Mbeki worked for the ANC in London from 1967 to 1970. He also spent time during this period undergoing military training in the Soviet Union. It is unclear when Mbeki first joined the South African Communist Party, but it is highly unlikely he would have been accepted for training in the Soviet Union without being a party member. Mbeki was Assistant Secretary to the Revolutionary Council of the ANC in Lusaka during 1971. In 1973 he moved to Botswana where he helped forge links with exiled members of the Maoist leaning, Black Conciousness Movement and recruited some into the ANC. The next few years were spent on organising underground work, in Swaziland, Botswana and Nigeria. He also joined the National Executive of the ANC in 1975. In 1978 he became Political Secretary in the Office of the President of the ANC and from 1985 to 1989 was Director of the ANC's Department of Information and Publicity. In this role Mbeki played a significant role in controversial meetings between the ANC leadership and South African business and political leaders, held in Zambia and elsewhere. Mbeki also doubled as a member of the ANC's Political and Military Council and the Central Committee of the South African Communist Party..
From 1989 Mbeki led the ANC delegation which held secret talks with the South African Government which led to the unbanning of the ANC and the SACP and the release of political prisoners. Mbeki was involved in the talks leading to the adoption of the interim Constitution for the new South Africa. Around 1990, Mbeki relinquished his SACP membership. 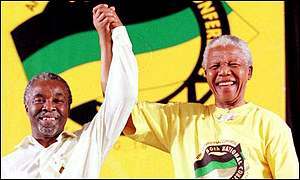 He was elected chairman of the ANC in 1993 and became vice President of South Africa after the 1994 elections. Since assuming the Presidency in 1999, Mbeki has generally steered South Africa on a moderate economic course. While the influence of the SACP in the leadership of the ANC has grown under Mbeki, the steady economic path has mean't that business and the public are little concerned about SACP cadres holding important posts. 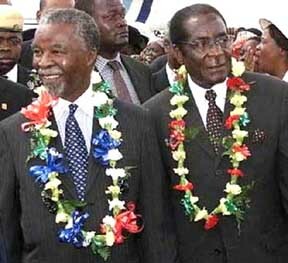 Mbeki has however cultivated close relationships with China and Cuba and the emerging leftist leaders of Latin America. This has only served to improve his standing with the SACP, ANC and the union movement. Throughout his terms as vice President and President, Mbeki has remained on good terms with SACP and has addressed some SACP conferences. Comrade Chairperson, Comrade General Secretary, other leaders of the Party. Let me say thank you very much for inviting me to speak this morning. ....I have a problem with the ANC. The ANC says that it is quite determined to make sure that we honour the constitution so that I only serve two terms. But I understand that the Party wants to run on its own, independent of the ANC. So if that decision is taken, I am going to join the Party. Provided, of course, comrades, you take a second decision to remove this 2-term policy! The last thing I would like to say, comrades, is that we have, as a movement, an important task to contribute to the progressive transformation of the African continent. We are historically an internationalist movement, and therefore it is natural that we should say what our international response is to this. But many people around the continent do expect that we should make our own contribution to the continent. That also is not easy. What do we mean by a progressive transformation of Africa? What are these forces on the African continent that are mobilised, that should be mobilised? Are they there? Can we take on that responsibility? To what end? We would have to ask many questions. You get reports that something like 3 million people have died in the Congo over the last few years because of the wars that are going on. But the amount of noise that you will hear about Zimbabwe, and no noise about the Congo, must surely raise questions as to why. Why is it so easy to ignore the death of 3 million people and make extraordinary volumes of noise about another country where only a few people have died. There is something not right about it. We have a challenge to contribute to the transformation of the world. 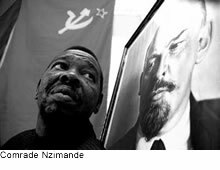 Blade (SACP Chairman Blade Nzimande) might say it means a proletarian revolution around the world. He might be right. I am raising this because I believe that if this Congress attends to this and provides some of the answers so we understand better and deeper the stage we are at, if we at this Congress can address all of these matters, it will make an enormous contribution to the strengthening of our country. I suspect that Thabo Mbeki, like Nelson Mandela, has remained a supporter, if not an actual secret member, of the South African Communist Party all along. He would not be the first covert communist to hold such a high post. Will Mbeki come out of the closet and openly re-join the SACP and try for a third or indefinite term in office?